When I first saw the Dual Control Levers, I was very skeptical about the design. In fact, most MTBers out there either love these things, or absolutely despise them. When I went to buy my new Trek Top Fuel (review coming soon) which had the Dual Control Levers, I debated whether or not to have the bike shop switch them out for the traditional "rapidfire" shifters. In the end, I chose to go with the Dual Control, and I have not looked back since. I think the main reason for this is that I have only been riding for a little over a year, and I didn't really "grow up" with the rapidfire shifters. There is a real technical innovation going on here, besides the fact that the traditional triggers are gone. These levers are combined with Low Normal shifting, in which cable pull moves the derailleur to smaller sprockets instead of larger ones (more on Low Normal later). The obvious difference between the dual control system and standard rapidfire shifting is the lack of individual shifting levers. 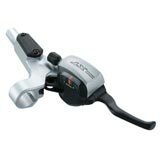 Rapidfire was easy to manipulate as it had two shift paddles and an independent brake lever. The all-new XT system has a single lever which not only controls braking but also takes over for all shifting duties. To activate the brakes you pull the lever towards the bar just as you would a normal brake lever. Pressing down on the brake lever allows you to shift into the smaller sprockets (up to three gears at a time). Tucking your fingers under the lever and lifting upwards is limited to one gear at a time. For those folks determined to shift with their thumb, Shimano left a small thumb paddle shifter located on the underside of each unit that can be used for upward shifts. I strongly recommend removing this right away, and just getting used to the single-lever system. Give the single-lever a try, in addition, the thumb paddle is in an awkward position, forcing you to really rotate your wrist in order to operate it. More on Low Normal: In a rapidfire system the shift from small to larger sprocket happens when you pull the cable, which means you have to press the thumb lever. The pressure on the cable is directly transmitted to the derailleur to move the chain sideways. In a Low Normal system, the "press-to-move" is gone. You click a trigger and the derailleur's spring tension moves the chain from small to large sprocket, with the assistance of the shaped teeth on the sprockets and matching HyperGlide chain. It seems that the tactile difference in Low Normal is what this might really be about, since in the rapidfire system pushing against derailleur spring resistance gives a shift to larger sprockets. With the Low Normal system, resistance equals smaller sprockets. My guess is that people with more riding experience than I are resistent to this change. Long-time riders almost certainly have automatic reflexes that may not adapt to Low Normal in one short test ride, so they usually don't like this system. This love/hate thing with the dual control is as much about "what you grew up with" as anything else. Just about every person reading this article is doing so from a computer connected to a QWERTY keyboard, and can type with relative ease on it, because its "what you grew up with". If we were suddenly faced with typing on a Dvorak keyboard, we would most certainly be resistent to the change, even if we were presented with research demonstrating the Drorak was more efficient and comfortable. Bottom Line: This is really a personal preference, but I have been very happy with the switch.